Read detailed reports on diplomatic living conditions in posts around the world from Chile to Cambodia. Chief of a diplomatic mission abroad. Official residence of the ambassador. Office where a chief of mission and his staff work. Diplomatic mission in a city other than the capital. Exemption of foreign diplomatic agents from local jurisdiction. Diplomatic mission of one Commonwealth country in another. Written authority to enter another country. 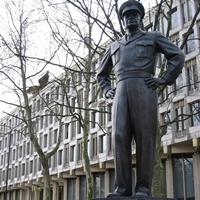 A statue of World War II General and former President Dwight D. Eisenhower welcomes visitors to the U.S. Embassy – London, United Kingdom. In its early history, Britain was subjected to many invasions and migrations from Scandinavia and the Continent. The Romans occupied Britain for several centuries. The Normans, the last of a long succession of invaders, conquered England in 1066.
is one of the largest cities in Europe and a center of international commerce, education and the arts. The London diplomatic corps consists of about 2,000 members and the consular corps has some 125. Each November, the Queen hosts a formal evening reception at Buckingham Palace or Windsor Castle for Heads of Mission and diplomatic staff.